The purported message entitled “Ebola Returns to Nigeria after Killing 3 and infecting 12” , continued to circulate on Facebook, WatsApp and Twitter, into Saturday, the day of the Gubernatorial and States Houses of Reps elections held nationwide. But debunking the rumour, a health official and Ebola expert Dr. Lawal Bakare described the message as malicious and a figment of the imagination of the originator. Bakare, who is Founder and spokesperson for “Ebola Alert”, the official Ebola notification body for Nigeria, said the anatomy of the message in itself is false. In an Official @EbolaAlert notification, Bakare remarked: “We found a fast spreading false rumour of Ebola cases in Nigeria. The rumour was initiated by an irresponsible blogger who lied that there are cases of Ebola in Nigeria just to generate traffic to her website. 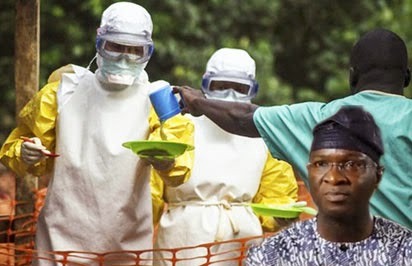 In his argument, Bakare said the World Health Organization, WHO, in partnership with the Nigerian Centre for Disease Control and the Lagos State Ministry of Health, have trained hospitals across Lagos and other parts of the country on how to report any suspect case of Ebola. “In fact, we had an extensive training and no health post nor hospital will call a blogger to report such information. “We will be one of the first to know if there is Ebola in Nigeria and be sure we will notify Nigerians through official and appropriate channels. Kindly help broadcast this as far as possible. Thank you,” he pleaded. He urged Nigerians to visit the EbolaAlert social media platforms for regular updates and inquiry on Ebola around the world and also visit www.ebolaalert.org for daily updates. Nigeria was declared Ebola free on October 20, 2014. A total of 20cases were recorded of which seven died and 11 recovered. A total of 25,226 cases have been recorded so far worldwide, of which 10,587 died.